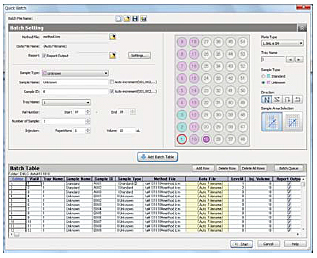 The LabSolutions analytical window features a user interface with a design similar to that of the i-Series flow lines. 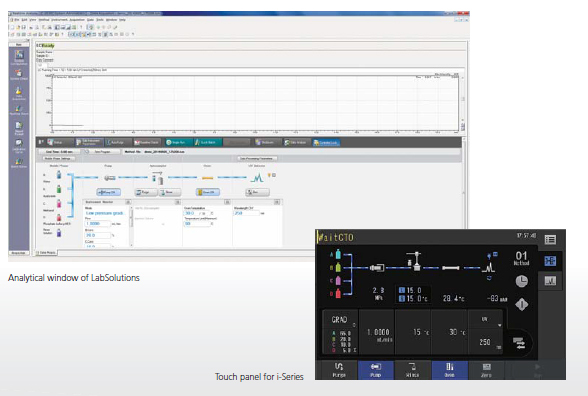 This allows you to create analytical methods by following the same steps as for the i-Series control panel. In addition, controlling the window icons enables various operations, such as ON/OFF of pump and oven, auto-purge, and batch creation. The LabSolutions Quick Batch window displays the sample rack mounted on the system. You can create batch files while checking the vial positions in thewindow.. 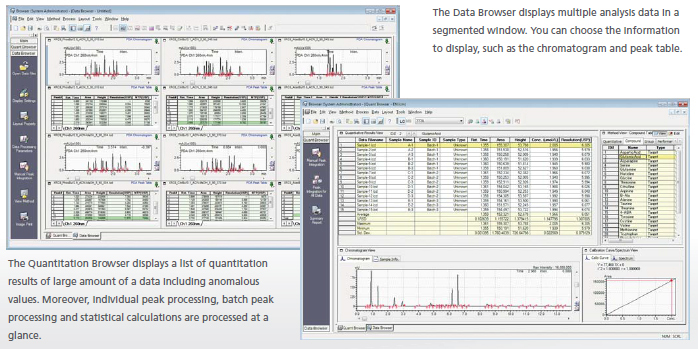 The Data Browser and Quantitation Browser in LabSolutions incredibly accelerate the comparison of multiple analytical data and processing of all quantitation results. Large amounts of data are intuitively handled by the drag-and-drop data loading and automated data loading from batch files.